I have a difficult time finding a Chardonnay that I like. They are often too round, too full bodied and taste too much like Butterscotch, or, if from Burgundy, they are too expensive. Very lovable, but expensive. Chablis hits the right summer notes EVERY time. Crisp, lemony melon. Long finish. Perfect with seafood, salads with chicken, oysters And I get excited when I find a half bottle on a restaurant wine list. Perfect to share with a good friend over a summer lunch. Benjy’s on Washington Avenue has a nice half bottle list. My friend, Melone is going to enjoy being introduced to this wine! She always lets me choose, because she knows I’m a little adventurous! So when you go to your wine store, look for a Chablis or Premiere Cru Chablis. NO Petite Chablis–despite sounding small and boutique, Petite Chabis is the bottom of the barrel, so to speak. Grand Cru Chablis is the pinnacle of Chabli. It comes from ONE perfect 250 acre parcel of southwest facing hillside, that is divided into seven vineyards — Les Clos, Blanchot, Bougros, Valmur, Valdesir, Preuses and Grenouilles. The soils in this parcel are comprised of ancient marine fossils, and mineral rich clay. This lime studded (Kimmeridgian Clay) soil gives wine a chalky minerality that sets it apart from lesser quality Chablis. Some of these Grand Cru wines may age in oak, but it will never be overwhelming. Grand Cru vineyards make fabulous wines that are typically not for everyday consumption pricing. At least not at my house. 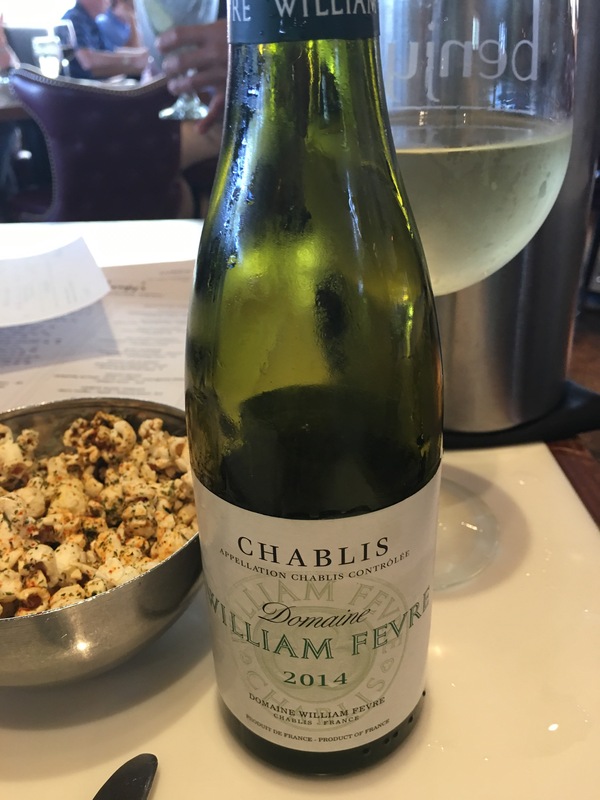 The William Fevre 2014 basic Chablis that I enjoyed with lunch is $22-27 a bottle. And in between, you have the William Fevre Premier Cru ‘Les Lys’ for $30-33. (Premier Cru is also seen as 1er Cru). The pinnacle William Fevre Grand Cru ‘Les Clos’ is typically $50-65. I can’t encourage you enough to add Chablis to your wine drinking repertoire. It’s typically un-Oaked (or only lightly Oaked) flavor is taut and it thrums with fresh, clean minerality. Big flavors but still polite and delicate. It really is the other Chardonnay. The precise, trim, angular sister to anything you’ve tried from California.